Increasing development of skyscrapers, booming tourism industry, expansion of public & private infrastructure as well as growing IT market are driving the demand for UPS systems in Malaysia. The demand for UPS systems is expected is expected to grow further in the IT industry in Malaysia as continuous power is necessary for such facilities to prevent data loss and maintain business continuity. Additionally, under the Visit Malaysia 2020 Plan, government is planning to increase the tourist footfall in the country over the coming years, which would also help to strengthen the hospitality sector of the country, thereby increasing the deployment of UPS in this domain. 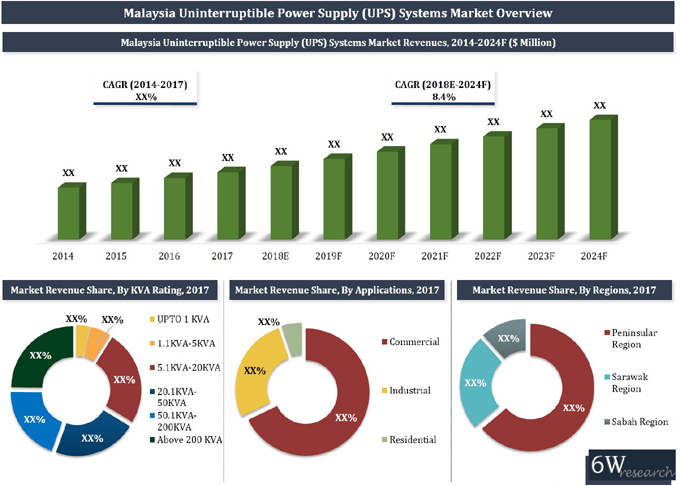 According to 6Wresearch, Malaysia Uninterruptible Power Supply (UPS) Market size is projected to grow at a CAGR of 8.4% during 2018-24. Government initiatives such as Economic Transformation Programme and 11th Malaysian Plan are anticipated to drive the growth of the construction, transportation and manufacturing industries. This would further proliferate the sales of UPS systems in Malaysian market during the forecast period. Amongst all the applications, the commercial application occupied majority of the revenue share, followed by the industrial application in the overall Malaysia UPS market share in 2017. Upcoming projects such as Fairmont Kuala Lumpur Tower 2, the exchange mall and KPJ Damansara 2 Specialist Hospital would generate more demand for UPS systems in the retail, offices, healthcare and other commercial segments over the coming years. Moreover, government efforts to boost the industrial and manufacturing sectors of Malaysia would also positively affect the growth of the UPS systems market in the country. Malaysia UPS Market report thoroughly covers the market by kVA ratings, applications, and regions. The Malaysia UPS market outlook report provides an unbiased and detailed analysis of the on-going Malaysia UPS Market trends, opportunities/high growth areas and market drivers which would help the stakeholders to device and align their market strategies according to the current and future market dynamics.